Updated Thursday July 26, 2018 by Jeff Knoll. This Sunday, 7/29 from 10:00 am to 2:00 pm, Modell's (391 S Oyster Bay Rd) will be hosting a special POBSC registration event. 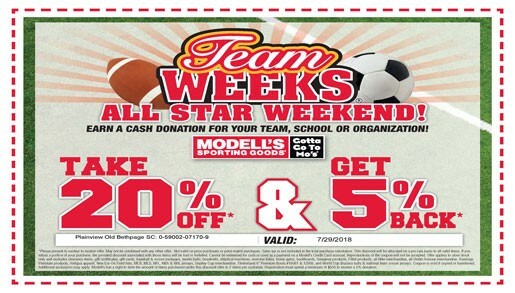 There you can sign up for the upcoming Intramural soccer season in person, as well as buy all your child's soccer gear (or whatever else you need) with a special 20% discount off all regularly priced and sale items (subject to the restrictions on the bottom of the attached coupon). In addition, you will receive a $10 cash card if you spend $50 or more and we will give all who register in person on Sunday a free POBSC magnet for your car. This is also a great chance to meet and ask questions of board members who will be there to help you register before the early bird discount ends on August 1st. Already registered for Intramural (or play Travel)? No problem, come on down, say hello, and you can still use the 20% coupon.